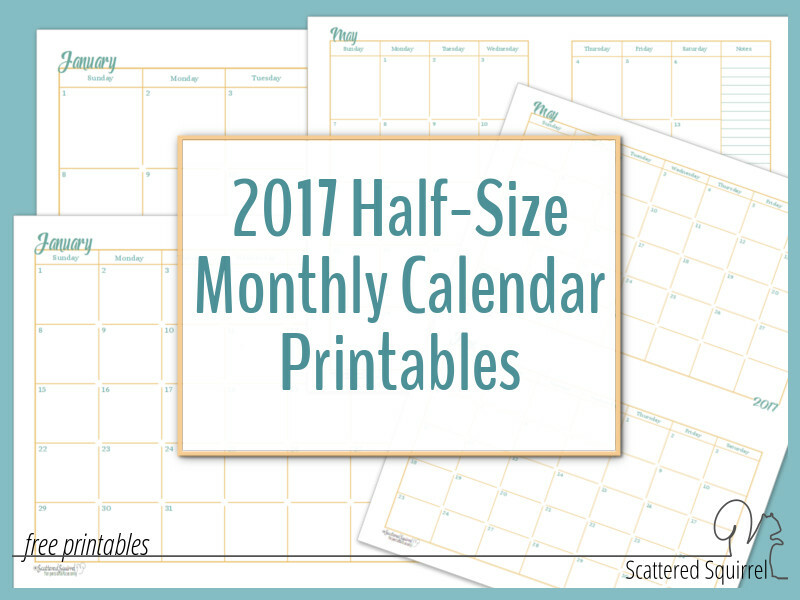 2017 Half-Size Monthly Calendar Printables are Finally Ready!!!! I was beginning to think that these calendars just weren’t going get finished. If it wasn’t one glitch it was another. But you know what, now that they are done I couldn’t be happier, especially since I get to share them with all of you. 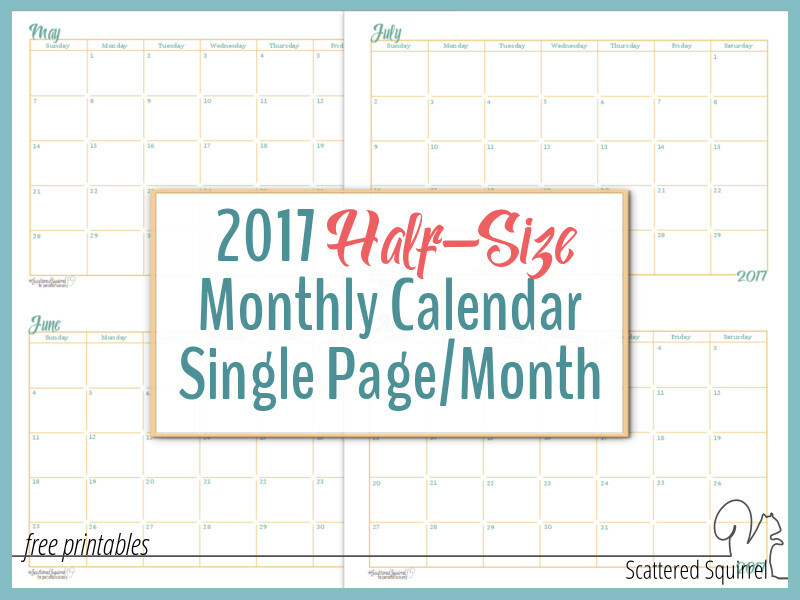 So, I’m not going to keep you any longer, let’s get to the good stuff and take a closer look at the 2017 Half-Size Monthly Calendar Printables. For the most part, these ones are exactly like the 2017 Full-Size Monthly Calendar Printables only half the size. I’m going to try really hard not to bore you by repeating everything I said last time, I’m just going to dive right to the goods. First up we have the single page per month calendars. 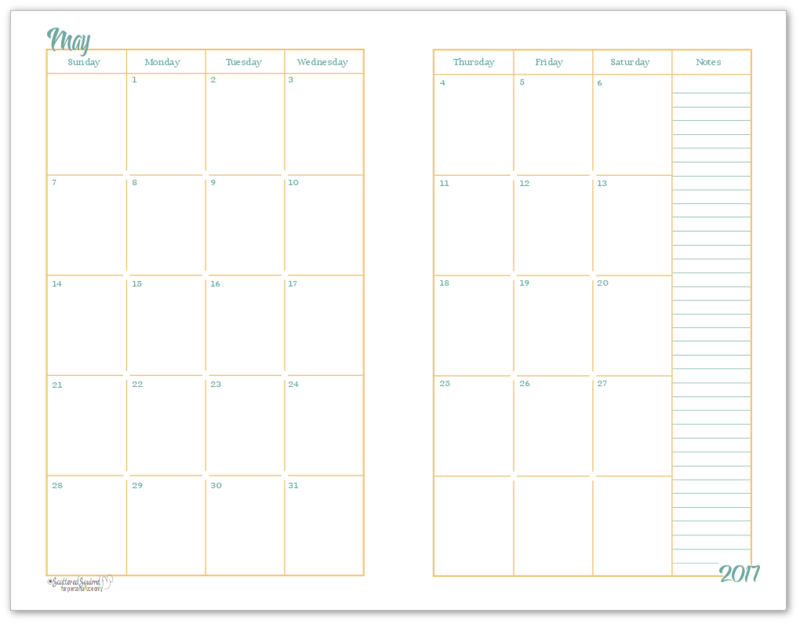 This layout of calendar, especially in half-size like this one, is great for those who like to have a monthly overview but don’t use their monthly calendars for a ton of planning. Just like the full-size counterparts these ones are designed in a landscape orientation and are just like the description says, one month per half-size page. As you can see in the picture below, these will print two months to a sheet of full-size (US Letter) piece of paper in portrait orientation (in case your printer is finicky like mine and you need to tell it the page orientation) for printing. Once you print them, simply cut them in half and you’ll be left with your half-size landscape calendars. As always, to get a copy of the printables you would like, simply click the pics! These half-size monthly calendar printables are the ones that I tend to use in my A5 planners. I like using my monthly calendars for long-term planning and they tend to fill up pretty fast, so the more room I have the better. Like their larger counterparts, these two pages per month calendars have a little more writing room as well as having a column for notes. As you will see in the picture below, these pintables are designed with two half-size pages on a US Letter Size piece of paper. These print in landscape orientation but the calendars themselves will be portrait once you cut the printed page in half. Do not print these ones back to back. It just doesn’t work. Every year I struggle with getting the half-size calendars set up in a way that they can be printed double-sided, and each year I end up back with the same layouts because the others are too complicated or too easy to mess up or only make sense to me. So, this year I decided to keep things really simple and make a companion printable for these ones. You can print this on the back of either of the half-size calendars and then you won’t be left with a blank page. Or, if you want, you can just print this all on its own and use it for note paper, stick it in your planner for jotting things down or use it for bullet journaling or whatever else you might want to use graph paper for. This is usually the part where I wrap things up and ask you to tell me what you think! 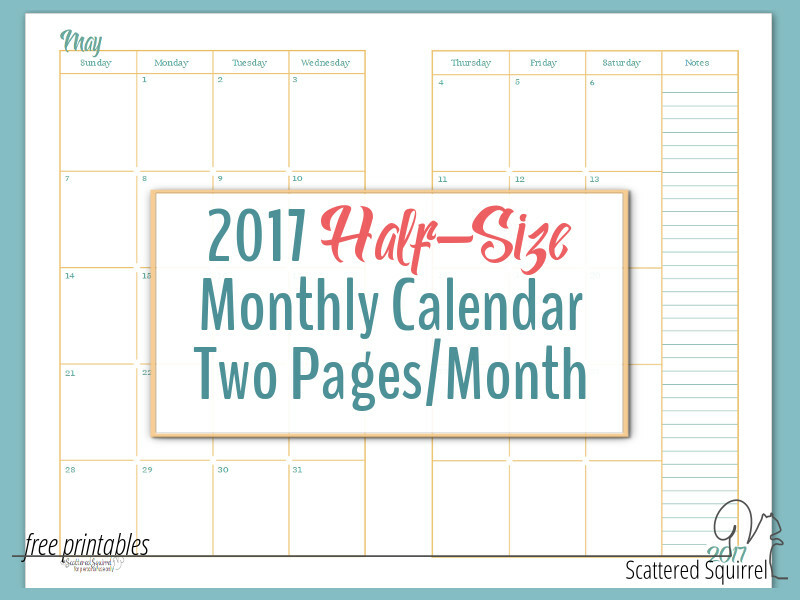 Don’t worry I still want to know what you think of the half-size monthly calendar printables, but before I let you go I did want to mention that there is another version of the 2017 calendars, which I’ll be sharing in my newsletter this weekend. So, if you haven’t had a chance to sign up yet, take a quick look over on the sidebar for the sign-up form. I send them out the newsletter every few weeks with all the latest blog posts and any secret printables that are only for newsletter subscribers. I’ve been kept hopping with a number of behind the scenes projects, as well as these calendars, but now that things are settling down I’m hoping to be able to add to that printable library a lot more in the future, so make sure you sign up so you don’t miss out! And now, dear friends, this is where I leave you! So tell me, what do you think of the 2017 calendars? Are you like the Blue Skies and Sunshine theme? Should I go for something a little different next time? 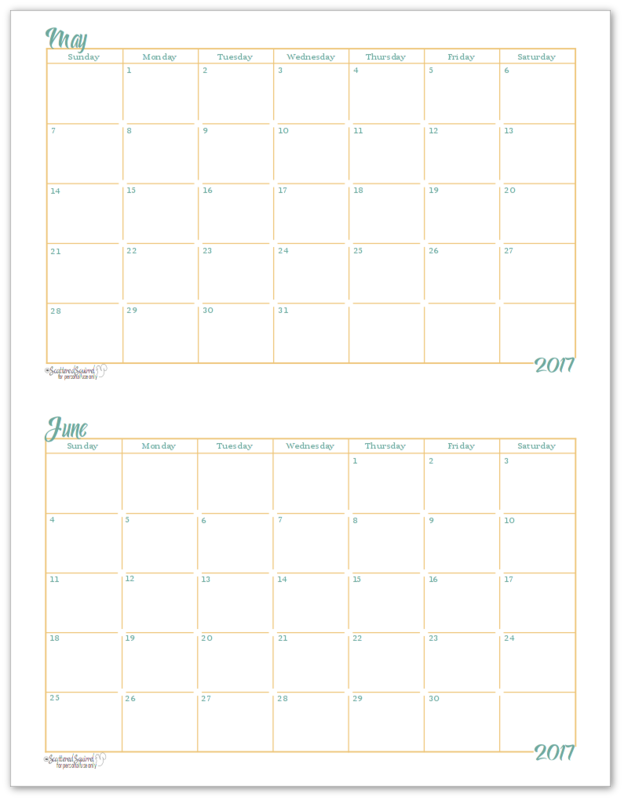 Previous Post: « 2017 Full-Size Monthly Calendar Printables are Here!!!!! lol Yes there are secret printables available for newsletter subscribers. I haven’t advertised it much because I haven’t been able to add to that library often, but I have big plans for that! First of all I want to tell you how much I appreciate all your hard work in bringing us all this beautiful printables! They are amazing!!! I was wondering if you might be willing to do different colors of the 2017 calendars in pastel colors…especially lavender, pink and mint green? I was also wondering if there might be any way you would consider making homeschooling planner items such as resource list, daily curriculum plan, attendance tracker, etc. Thank you so much for your time and consideration! I wish you and your loved ones a wonderful and blessed week! I hope I was able to help a little. Where do we find the secret library??? Hi Julie, the secret library is still a work in progress, but you can find it by signing up for my newsletter. If you’ve already signed up, stay tuned for a quick one that’s coming out later this weekend. I had to move to a different mail service and I’m still learning the new one, so I haven’t sent a newsletter out in a while. I include the link and the password in each newsletter. I come back to your site every year! I love your calendars! I was just wondering if you created a 2016/2017 calendar that each month is two pages?? maybe I just missed it! Hi Ali, thank you so much. I have a 2016 calendar and a 2017 calendar, but not one that is combined. I’m not sure if that helps you at all, but I hope it helps clear things up. Hi, Alli! Thank you so much for sharing your organizational insights and tools with us. I started using your materials in the 2015 calendar year & find them to be just what I need. No worries, I just replied to you too! They are coming! 🙂 Oh I’m so happy to hear that you like the two page weekly ones. Those are some of my favourites too. Hi Sarah, I have undated calendars that I will be sharing later this year in the Understated Rainbow colour scheme, and I plan to make some daily, weekly, and monthly ones to match the 2017 colours and fonts before the end of this year. I’m thinking a few of them will be appearing in the 31 Days series this year. I hope that helps. where do i download the calendars? I’m a newbie. Do you also have or suggest a weekly planning page? Hi Laura, welcome! I’m so glad you found us. We have a variety of weekly planners that you can choose from on the Weekly Planner Page and some new ones on the Home and Life Organized page. What kind of weekly planner are you looking for? Maybe I can help narrow down the search. Thank you for sharing your printables. i LOVE your monthly calendar planners….awesome.. Thank you so much Dott! I hope you enjoy using them. I really like the color scheme for the new year. Thank you for making them available to us! Oh I’m so happy to hear that you like it. I hope you enjoy using them. THANK YOU!! This is the only place to find these set up this way. I used previous pages from your previous printables of half page qoals and printed these on the backs. I just had to reload the monthly goal pages in starting with december and the half page calendars print perfectly on the back. I am thrilled to hear that Jennifer. I’m happy that you’re liking the printables and that they’re continuing to work for you. Last year, 2016, I was able to print a calendar that had a month on two sheets of paper. My son was thrilled to be able to use it in his journal for our farm since the squares gave him plenty of room for his notes. I’m a little behind this year but things are just starting to warm up here on the farm and he is ready for 2017’s pages and I can’t seem to locate them on your site. Can you point me in the right direction? You bet! If you type 2017 Calendar into the search box on top of the side bar, it’ll bring them up in the search results. I hope that helps. The 2018 ones will be coming out soon too, if you want to grab them ahead of time. How do you punch the holes correctly for these? Thank you for sharing! For the single page per month calendars, I typically punch the holes at the bottom edge of each calendar. That’s just personal preference. For the two-pages per month, once I cut the paper in half I punch on the cut edge so that when they are in my planner I can see the whole month open before me. 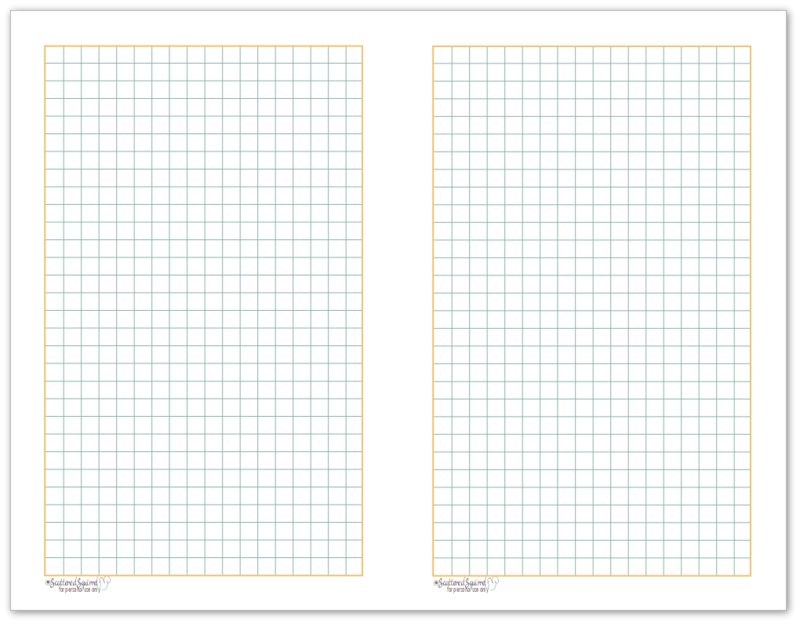 So today I did a search for FREE planner printable size 5 1/2 x 8 1/2 and here it is! Thank you so much – and I wanted portrait so that is working too – thank you so very very much! I signed up for your newsletter too – have a blessed week – you have truly blessed me! I’m so happy you found us and that you’ve found some printables that will work for you. Thank you so much for signing up for the newsletter.